I can't explain why it stirs my soul when I see the mountains. Not just any mountains, my mountains. 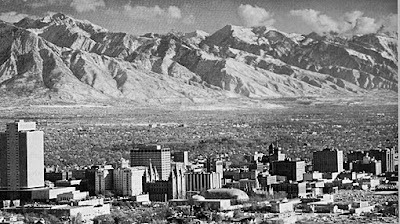 The Unitahs, the Wasatch Front. The great towering, majestic rocks that welcome me home, again. Emotions are on the tip of my heart. My eyes always get just a bit misty. Because while I love traveling and seeing new places with my oh so adventurous husband, I always love coming back to the west that I call home. We loved seeing family we don't see very often. We loved the seafood. We always love the ocean. So, thank you Connecticut for helping us pay our bills, I'm sure we'll back in your neck of the woods someday. But now, back to our mountain desert. Speaking of mountain homes. Ours will be in the tops of the mountains for a little while. During our transition period, while we look for a permanent residence, 6500 feet. So feel free to come visit us. The leaves are starting to change. In a few weeks the trees will be brilliant. Welcome home! I too love to be here, this is our home. Where you going to settle? I Hope everything is going well for you guys! I LOVE coming home!! Hope you get settled soon!! Good luck! !